Saturday's kendo class was a great one, though it was pretty out of the ordinary. For starters, aside from Ton-sensei there were only four of us in bogu. Martijn, Jeroen, Felix and Aaron were all out of armor due to minor injuries, so that left us with a rather small group of folks actively fighting. While my small group was doing more advanced practice, Martijn and Jeroen took charge of the large group of newbies. There were three folks who'd never been with us before, to check it out. And there's one or two guys who've been tagging along for a few weeks. So, what did we do? No footwork practice! After warmup we went straight into kirikaeshi, followed by kihon and waza practice. Most notably: men uchi, fast men uchi, fast kote, fast kote-men, harai men, harai kote, harai kote-men and maki waza. Each of these we did for 4x3 repetitions. The last fifteen to twenty minutes of class were spent on jigeiko, where I definitely felt that I was too tense in my arms. How? Because I couldn't stand through more than two geiko and had to be dragged through the third. The most important thing I'm taking away from this class is something I also realized after taking part in the NK: kendo is a dialogue. I should not just rush in and try to whack at targets. Wait it out. "Talk" to my opponent, so we can decide who gets to score which point. Ton-sensei specifically berated me for rushing in. And Charel-sempai suggested that I simply work towards the ikkyu grading: "It doesn't matter who attacks more, or even who wins! As long as you make good strikes and show good technique, then you'll make progress.". As I mentioned earlier today, I've designed a bunch of clothes for the Renshinjuku Kendo dojo. 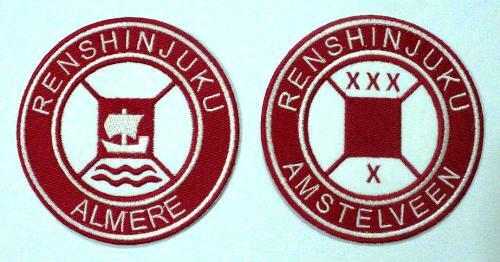 I originally started work on these designs sometime in january and gave it a fresh start with renewed vigour after designing the Renshinjuku Almere logo. My original goal was to have some RSJ-branded sports gear for my running practice, but after finishing the first designs I decided to set up a shop for all RSJ members. I've been dealing with Spreadshirt for a few years now and I've always been very happy with their work, so logically the shop's run by them. A mesh sports shirt. Logo on the front and RSJ-020 / RSJ-036 on the back. A t-shirt. Logo on the front and the Renshinjuku name in kanji on the back. A children's t-shirt. Logo on the front and "Let's kendo!" on the back. A track jacked. Logo on the front. A hooded sweater. Logo on the front and the Renshinjuku name in kanji on the back. A sleeveless shirt. The dojo's motto "Heijoshin" on the front, in kanji. Shown above are the sports shirt (white) and the normal t-shirt (grey). This morning I received an email from Heeren-sensei, the founder of our kendo dojo. A few weeks back I'd sent him the vector files I'd made for the Amstelveen and Almere dojo logos. After discussing the matter for weeks and months I designed the Almere logo, based on the Amstelveen original and after a few rounds with Heeren-sensei, Ton-sensei nd Peter and Zicarlo sempai we'd come to a design to everybody's liking. Now... That email contained a sample of badges that Heeren-sensei is having sourced from Pakistan, based on the vector files I put together. I'd lie if I said I wasn't at least a little proud (^_^;) IMNSHO, the badges look awesome! If I can I'll order at least three badges: one for my gi, one for my next gi and one for a sweater. Last time I went to the Amstelveen dojo, I had an anxiety attack (only a slight one) after being thoroughly exhausted by the training. At the time it wasn't safe for me to drive myself home, so I was lucky to have Martijn with me. That one event has thrown up a barrier for me to go to Amstelveen alone. Last week I had an excuse not to attend training in the form of my Standby Duty for $CLIENT. This week I was happy to have Peter-sempai come along, so he could be my proverbial savior if things went wrong again. But unfortunately Peter had to call off because of work, so now I am left to face my anxieties. I do not want my anxieties to stop me from practicing kendo in Amstelveen. But I would lie if I said I wasn't a bit nervous about going tonight. I'm alone, with no alternative driver to take me home. as I said: I don't want my anxiety to interfere with my training! I'm going tonight, come what may! I'll just have to be smart about it! If I feel that I've overexerted myself, I will stop for the night. And as always I am prepared for problems! I have enou fluids with me, I have dextrose and a snack with me, I always carry a bag for hyperventilation. I'm just as prepared as I could ever be! Nothing to stop me! I went. It went fine. I was a bit tired at the end, but some dextrose helped out. I trained with the beginners' group and served as motodachi for harai-kote practice. Gave me a good chance to practice my posture and kamae. Roelof-sensei remarked that I was way too tense. He also showed me the proper technique for receiving blows in kirikaeshi.